If you've been searching for a different variety to use as both a ground cover and bedding plant, we've got the perfect daffodil for you! 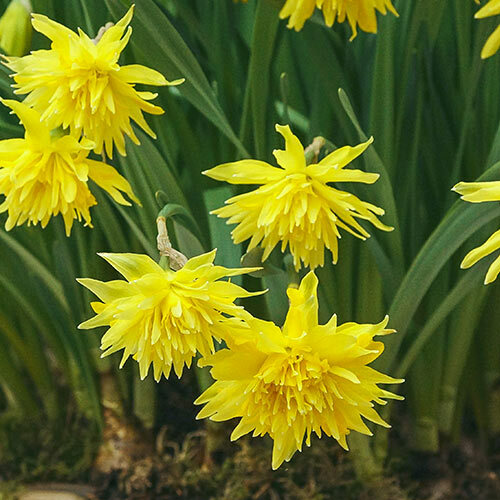 Rip Van winkle is a unique small-cupped, miniature daff that somewhat resembles a dandelion-and it is so sunny and bright, you'll be drawn to it immediately. Once in bloom, they last for weeks and naturalize readily, returning year after year in increased numbers. The fragrant, 6" high blooms are fully double with an exotic sprigged look-you won't find another like it in garden centers or big box stores. For the greatest impact, plant them in front borders, mixed container gardens, rockeries and cutting gardens. 2-2.5" fully double, uniquely shaped flowers. Plant 6" deep and 4 - 5" apart. Loosen soil well before planting.